WHAT IS IT? NOw that summer is here, you might need this. The Arctic Cove 18-volt Bucket-Top misting fan incorporates a fan and adjustable mist control. 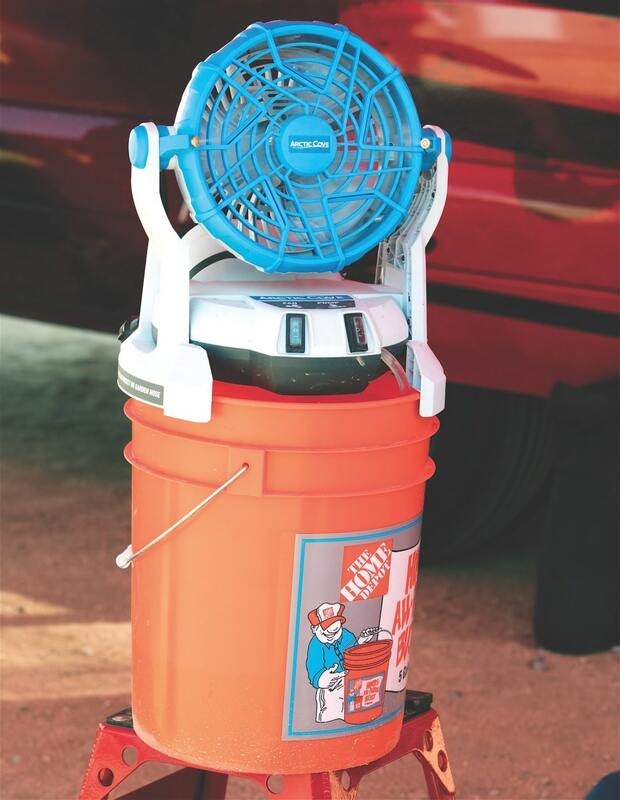 The fan unit sits on top of any 5-gallon plastic bucket and provides a steady mist thanks to a two-speed fan and quiet pump performance. 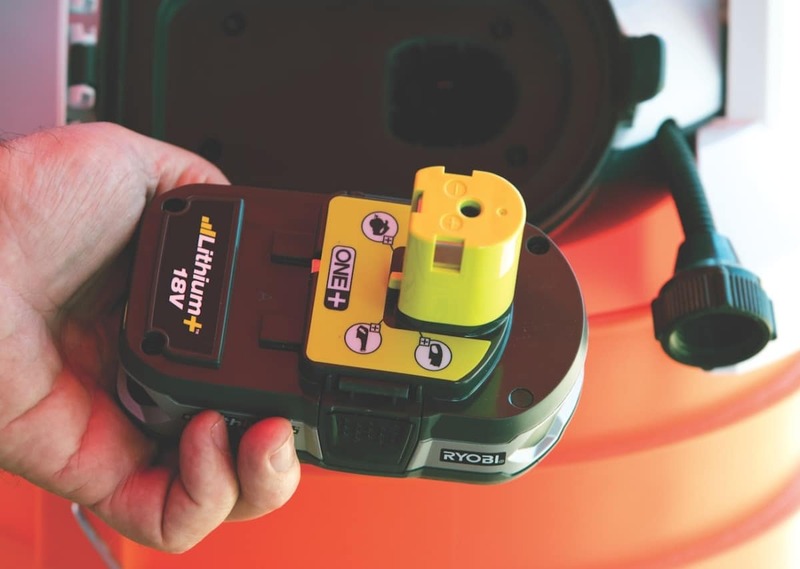 Power is supplied by a rechargeable, cordless, Ryobi, 18-volt battery (included). The fan is portable, with dimensions of 15 inches tall and 12.25 inches wide. WHAT’S IT COST? $79.95 (5-gallon bucket extra). CONTACT? Home Depot or www.arcticcove.com. WHAT STANDS OUT? Here’s a list of things that stand out with the Arctic Cove 18-volt Bucket-Top misting fan. (1) Design. The fan unit has a base that is designed to sit on top of a plastic bucket. The fan is made by Ryobi, and power comes from a 1.3Ah Ryobi OnePlus power-tool battery (charger is included). The fan has a pivoting head that allows the user to aim the mist accurately. A hose with a filter on the end of it can be uncoiled from under the fan base to submerge into the water-filled 5-gallon bucket. There are two switches on the base of the fan: (1) A two-speed switch for the fan. (2) A two-way switch to meter the amount of water supplied to the mister nozzles. The nozzles are standard brass mister nozzles mounted on each side of the fan. (2) Battery life. The supplied 1.3Ah OnePlus battery has a run-time of three hours on the low-speed setting. Coincidentally, 5 gallons of water just happens to last three hours (at an average of 1.5 gallons per hour). The Arctic Cove mister system comes with a garden-hose attachment for an unlimited supply of water. It is designed to sit on a bucket, but can sit on a table or flat ground when the garden hose is used as a water source. (3) Tips. The MXA wrecking crew uses the Arctic Cove mister in the pits on hot days. If your pits have a source of clean water, you can fill the bucket up at the track. If not, you can carry spare water in a clean 5-gallon gas can or water container. If you own Ryobi power tools, you will have a source of extra Ryobi OnePlus batteries. If not, you can buy a spare 1.3Ah battery for around $40, but Ryobi has OnePlus batteries that produce as much as 4Ah (for a 10-hour run-time). We charge two batteries before a race and carry both of them to the track. After three hours, we refill the bucket with water and change the battery. We rarely run the mister non-stop, since it is cool in the morning and we don’t need it running when we aren’t in the pit area. To get the best performance from the Arctic Cove mister, take the time to read the wind. With the wind at its back, the fan can cover a fairly large surface area. (4) Performance. It works extremely well. Misted air is as much as 20 degrees cooler than the ambient temperature. The only downside—although not for riders who just came in from a hot, sweaty moto—is that if you sit too close, you get wet. 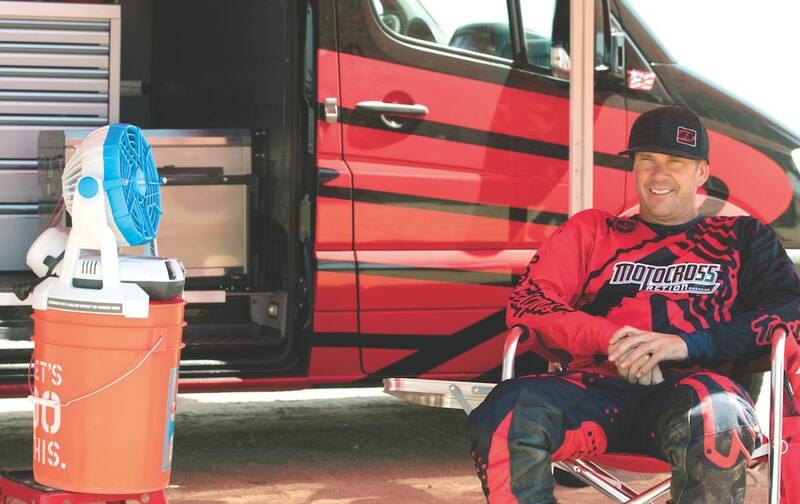 Because it is portable, you can take it to the races, soccer games or to backyard barbecues. WHAT’S THE SQUAWK? The most important thing to pay attention to is to not allow the bucket to run out of water while the pump is running. The pump will blow up like a super-lean two-stroke if water isn’t going through it. Plus, you will find out very quickly which of your friends are mister hogs. MXA RATING: An $80 mister system is not a luxury; on a 95-degree day it is a necessity.